Fans consider the Big Game a November tradition (this year’s postponement to Dec. 1 notwithstanding), but the first contest between Cal and Stanford was played March 19, 1892, at Haight Street Grounds in San Francisco. The first 13 games between the schools were held at the San Francisco site on the east side of Golden Gate Park. “It was the top sporting event in the city of San Francisco at the time and by 1900 it was already being referred to as the ‘Big Game,’” writes Cameron Satterlee in an online history of the contest (www.ruleoftree.com). Cal students parade on campus with the Stanford Axe in April 1899. 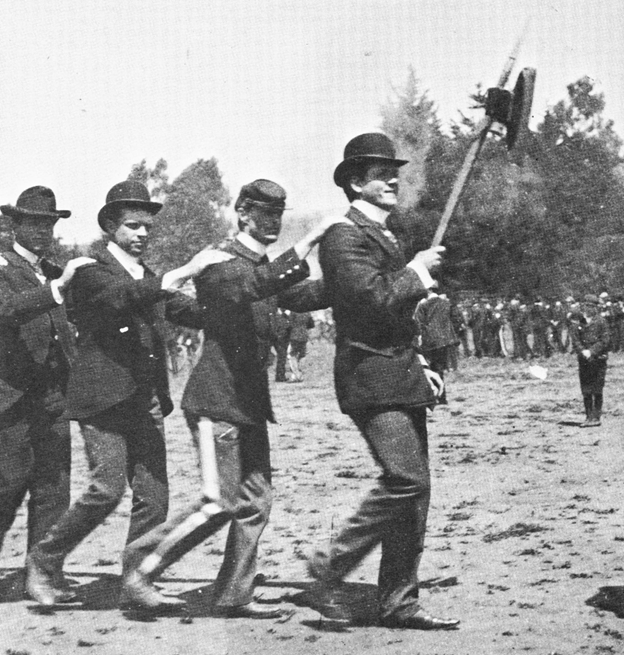 According to “The University of California: A Pictorial History,” the famed Stanford Axe made its debut not at a football game, but a baseball contest between Cal and Stanford in 1899. It was promptly stolen by UC students and its handle was sawed down in a butcher shop before it was hidden and taken by ferry to the East Bay. It was then locked in a Berkeley bank vault for 31 years. Stanford succeeded in stealing it back when it was being returned to the vault following an April 1930 rally. Starting in 1933, the axe has been awarded annually to the Big Game winner. 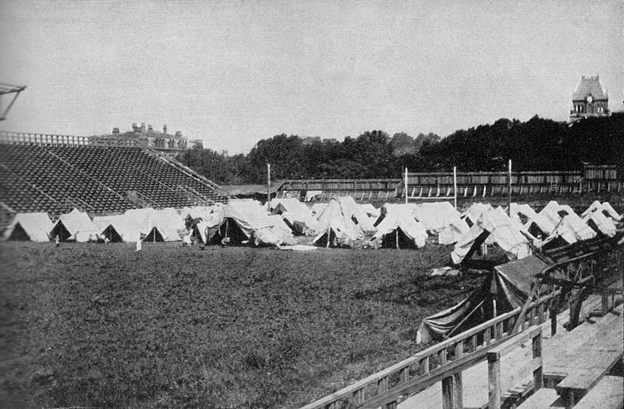 Tents of refugees of the 1906 earthquake on the turf of California Field. 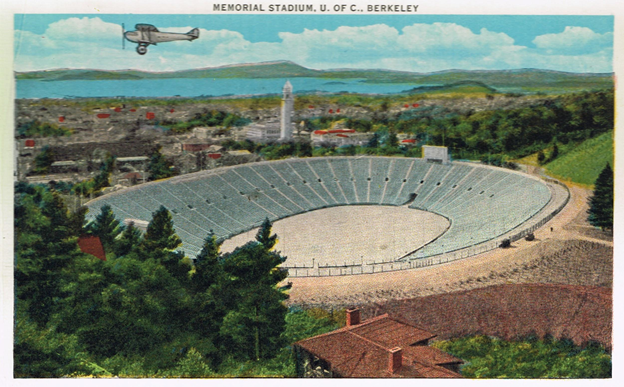 The first game in Berkeley was in 1904 at California Field on campus. Stanford hosted its first game at new Stanford Field in 1905. The 1906 game was held just months after California Field was opened to refugees of the great San Francisco earthquake, who were allowed to pitch tents on the sod. 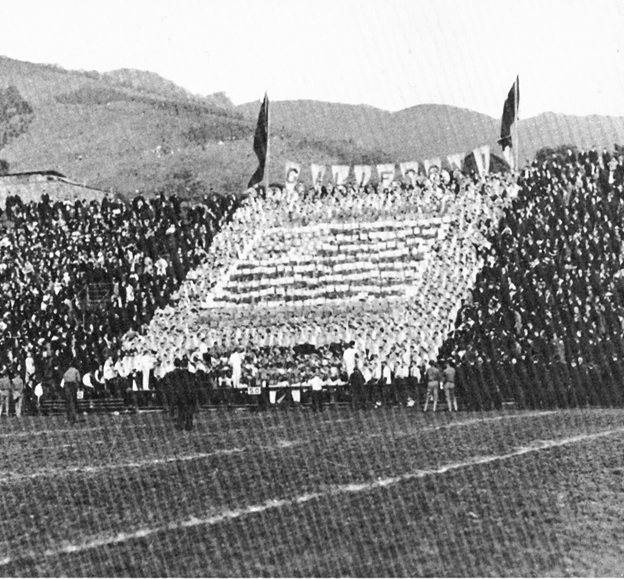 A Golden Bear rooting section card stunt at California Field in 1912. 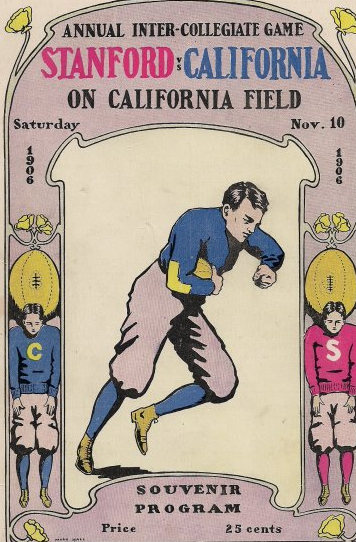 Rooter section card stunts were introduced at halftime of the Big Game at California Field in 1908. In 1906, both schools switched to rugby, prompted by a rising national concern about deaths and serious injuries attributed to American football. Rugby contests continued until UC Berkeley went back to football in 1915. Stanford did not follow suit until 1918, but the game that year is not counted in the official list because both schools used Student Army Training Corps members as players. The game was held on Thanksgiving Day, less than three weeks after the end of World War I. An artist’s rendering of Cal’s Memorial Stadium. Memorial Stadium in Berkeley opened in 1923 and scenes from Harold Lloyd’s silent film comedy “The Freshman” were filmed on the field at halftime of the 1924 Big Game. Stanford Stadium opened three years earlier.